The last couple days have been interesting, in the Chinese curse sense of that word. I’ve got two reports that the clients need ASAP. That’s normal for this time of year. Neither is very complicated, and neither project has anything in the way of what they want to do. It’s the other stuff that’s been a bit over the top. For one thing, my admin assistant is on an extended leave, and getting a temporary replacement is proving hard, so I’m having to try to get her work done too. The person who usually fills in for her had to go out for some medical stuff, and the person who was going to fill in for her had his girlfriend medevaced the evening before he was supposed to start, and the doctors don’t want her flying so close to delivery, so he had to stay with her. Everyone is OK, thank goodness, which is the main thing, but it doesn’t get the office work done. On top of that, I’ve had 3 abstracts for meeting papers due, only one of which is in yet, travel to arrange for a meeting in Munich (which the organizers want done ASAP so they know how much they’ve got left after paying for a ticket from Barrow to Munich), vacation travel to arrange to Hawaii and upstate New York (which needs to happen ASAP so we can afford the tickets and don’t have to go by way of Phoenix or Atlanta), two separate people who need the list of UIC Science phones & emails (which I update at least monthly, to no effect, since the updates appear to get lost and ancient lists resurface with phones that have been disconnected for two years), a new company budget process, credit cards to reconcile & approve (and a clunky new system to do it with), some checks to print, possibly a proposal to work on with a colleague in the Lower 48, the DMV had apparently lost paperwork regarding insurance on a company truck that was involved in a fender-bender, and a bunch more stuff I’ve forgotten. You’ll have noticed most of this needs connectivity. Tuesday evening, in the middle of this I got a call from my staff saying the power was messed up in a building that houses the offices of the ARM project. The guys got a small generator to provide clean power to the servers, which needed a midnight refueling and we got the landlord to get the power company, but no luck. The next day they came back out, and decided all power would need to be shut off to change a transformer that feeds all of NARL. This required shutting down all servers, so no connectivity. No email, no Web, no Skype, no VOIP phones. At least the BARC had power from the generator, so I could write. In the middle of that, a fellow who works with my husband had a propane explosion on his boat while out whaling. Amazingly, the boat did not sink, only one guy had to go to the hospital in an ambulance (although they all got checked out) and everything went about as well as it could have gone. The windows were all blown out, some of the guys had glass embedded in their coats, I’ve heard, but no serious cuts. Pretty much a miracle. We scrambled around getting our Herman Nelson heater back from a fellow who had borrowed it to deal with the aftermath of a winter house fire, so that we would be able to keep the pipes from freezing if it got really cold. The power came on at the end of the day, only to find out that the ARM building still had bad power, so into a second night of refueling. It proved really complicated to take the servers down, and the guy handling the job is really sick at the moment, so it was decided not to bring them back up until we were sure there wouldn’t be an abrupt power cut. They started this morning, but it took until early afternoon until everything was mostly back to normal. Then the queued email flood began. My husband was on the way to Anchorage this evening, and we had to get BASC checks printed so he could sign them (the other check signers are busy with whaling right now) before he left. The power guys got the ARM building back on-line in the afternoon, the checks got done, and I actually was able to email some of the stuff people needed to them. But the best thing was after work, after I dropped Glenn off at the airport, I got to go out to the old NARL runway. 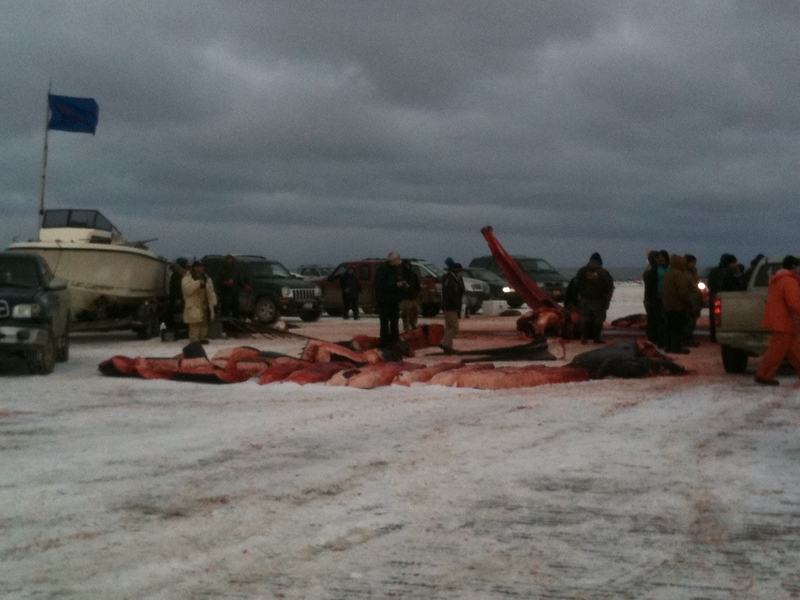 Barrow caught three whales today (Savik, Saavgaq and Panigeo crews); one was already butchered when I got there, and many happy people were working on the other two. I talked to Maasak Brower, who had a huge smile on his face, and the first thing he said to me was it was a good day. It’s a fine thing to have a whale give itself and help you feed the community. Maktak and flipper from Savik crew's whale. Mandible (jawbone) of Panigeo crew's whale in foreground. 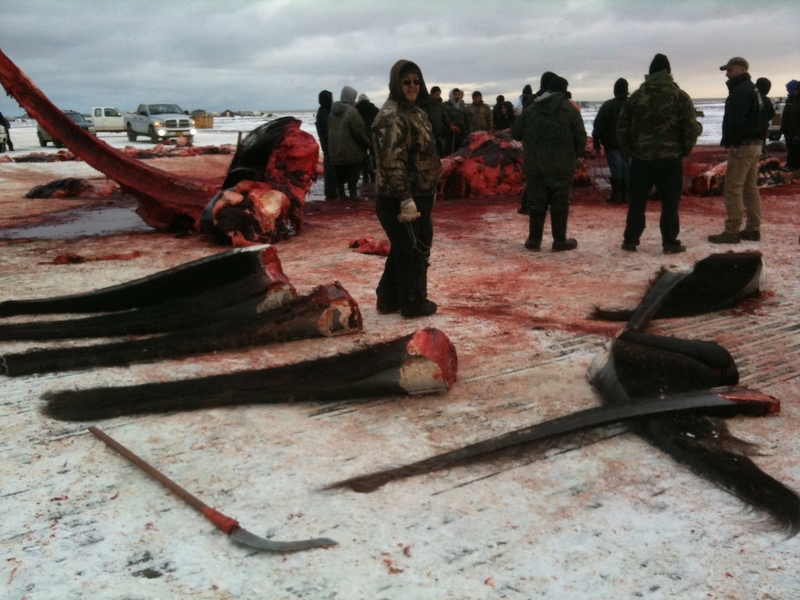 Some of the whale still being butchered is in the upper right, and in the background are some of the shares that will go to many people in the community of Barrow and beyond. The meat and maktak is distributed according to set rules. Shares go to the captain, to the boat (or its owner, since the boats don’t eat maktak), various crew members, other boats that helped tow the whale in, and to anyone who turned up and helped with the butchering. 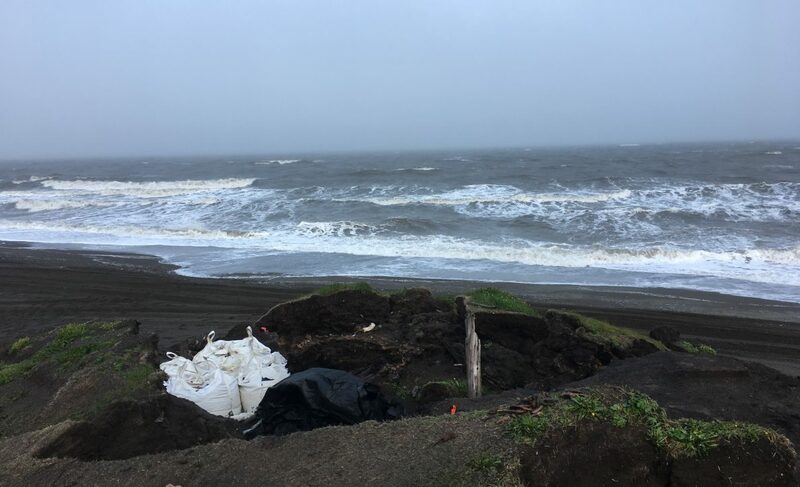 In turn, those shares will be passed on to family members and friends across the North Slope and Alaska and down to the Lower 48. 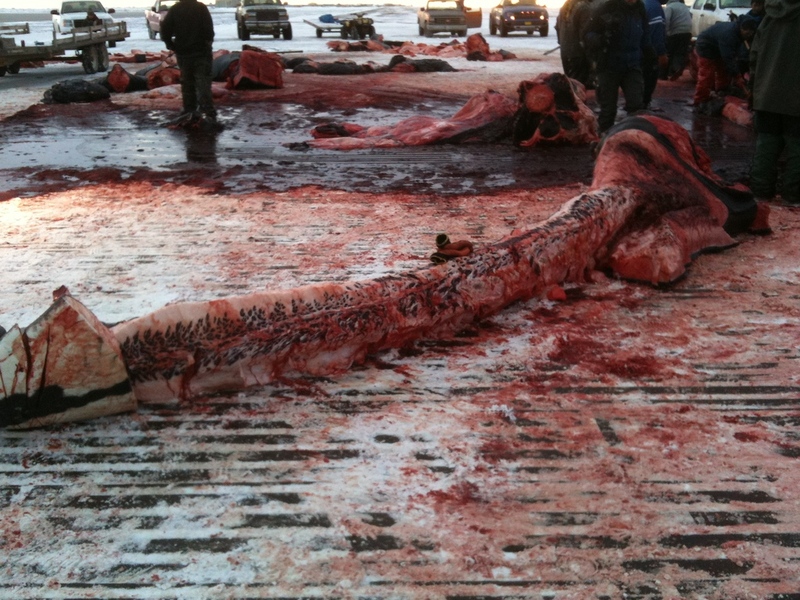 It takes about 3-4 hours to completely cut up a 30 foot (~10 m) whale, which weighs about 30 tons. Then shares are distributed and people bring them home. There has been a constant stream of vehicles, some with trailers piled with maktak, past my house, coming back from the runway. Guys went out in really small boats on a very cold ocean, about 1000 miles from the nearest Coast Guard help, and had leviathans give themselves to them, and towed them home, and got a lot of food for people, as their ancestors have for many centuries. Tomorrow, weather permitting, people will try again. 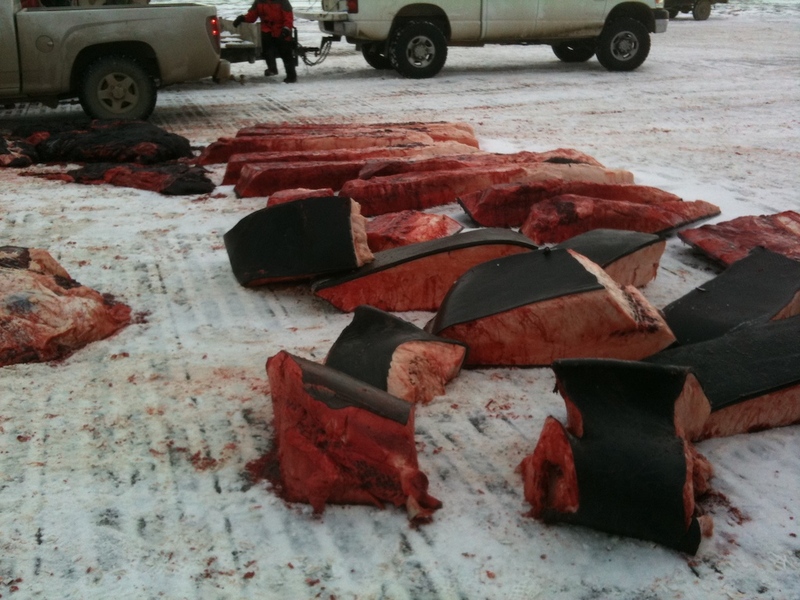 Posted on October 7, 2010 by Anne JensenPosted in Arctic, Barrow, whalingTagged Arctic, Barrow, whales. Next Next post: More Whales! Hey, hey, hey Iceberg 17! Hey, we’re heading to Hawai’i too! When are you guys going? Thoroughly interesting blog, Anne – I wondered about the sea ice webcam. And great photos – Anne Slater said it perfectly. We’re going to be there 11/22 through 12/3.